The Hon f "ble the Political Resident A senior ranking political representative (equivalent to a Consul General) from the diplomatic corps of the Government of India or one of its subordinate provincial governments, in charge of a Political Residency. 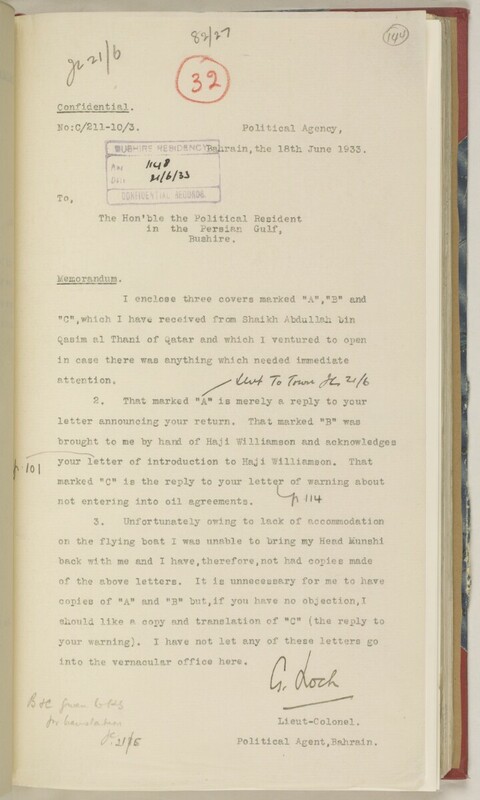 on the flying boat I was unable to bring my Head Munshi A secretary or political assistant working in the British administration in the Gulf, often also providing linguistic interpretation. copies of "A" and "B" but,if you have no objection,! into the vernacular office here.